With rubber bushings. Quantity of needles: 272; Diameter: 51 mm (2.008 in); Width: 40 mm (1.575 in); Step: 3,5 mm (0.138 in). Using this applicator you can affect any part of the body. But, it is the best to massage the facial zones in order to remove pain and spasm, the hairy part of the head, the small joints of the extremities, the hands and feet. 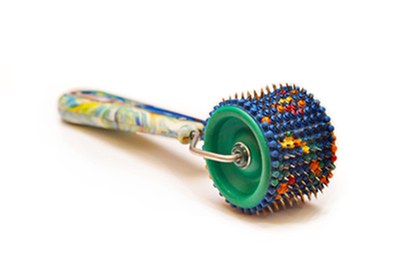 This skin roller should to be used in cosmetology, and it is also a handy tool for exact reflex diagnostic. Massage with the roller applicator is like “a needle rain” which will recover tired nervous system and remove muscle tension. If you regularly give the applicator massage to the face, you will refresh your skin and acquire a healthy complexion.